FROM ice-skating to footy. 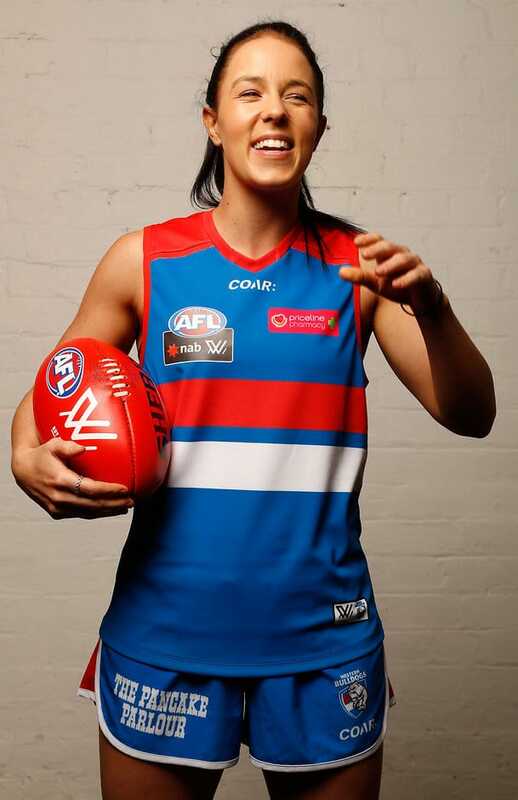 It's not a conventional path but it's the one Western Bulldogs onballer Brooke Lochland has taken. Her rise through the football ranks happened very quickly once she took to the sport. She only started playing in the second half of 2014, with the Montmorency Magpies, north-east of Melbourne. Lochland made an instant impact. "She won most games off her own boot," said David Schultz, the former head of the women's program at Montmorency. Prior to that, Lochland had been one of Australia's star skaters. She started inline skating at four and quickly took to the sport. The world championships beckoned for most of her teenage years. At 16, Lochland dropped out of school and followed her coach Desly Hill to the Netherlands, where Hill had been headhunted for a job. Being away from everyone she knew posed challenges, but Lochland had housemates in a similar situation. "We called it the 'Aussie house'. We had about three or four Aussies in the one house getting used to living away from home," Lochland told AFL.com.au. A couple of years later she switched to ice-skating, reasoning the move would give her the chance to become an Olympian. Competing at the Sochi Winter Olympics in Russia in 2014 was her goal. It would be a difficult year, though. Her mother was stricken with cancer and Lochland returned to Australia for six months, a time she cherished. With just three months before the cut-off date to qualify for Sochi, she headed to the United States in a final bid to make the Olympic team. Following a stressful year, she missed out on selection. Lochland decided she was finished with skating and returned home. She began working at a pub and was one day cleaning a table that seated members of the Montmorency committee, including Schultz. He invited her to the club and Lochland returned to the sport she had played for a couple of years in her younger days. The Pies were in division four at the time and started the season 2-7. Lochland was thrown into the midfield of the division four side and the Pies won five consecutive matches, including the grand final. In division two the following year, the Pies fell in the grand final, with Lochland winning the award for the competition's best and fairest player. She’s 159cm but Lochland overcomes her lack of size with speed, toughness and gut-running. Skating taught her the work ethic of a professional athlete, after she trained at least five hours a day in Holland. The Magpies folded before the 2016 season and Lochland joined Melbourne University in the VFL Women's competition, helping the Mugars to the grand final. They would fall narrowly to Darebin. The Bulldogs selected Lochland at No.53 in the NAB AFL Women's Draft. She works full-time as a customer service manager at The Ridge Health Club in Eltham in Melbourne’s north-east, where Schultz is her boss. Her job at a gym allows her to work out up to twice a day before heading off to football training. The insatiable work ethic that has seen her experience rapid improvement as a footballer will serve her well, according to Schultz. "There are not too many players who have done it so quickly. That's the thing with Brooke. The next two years she's just going to get better and better," he said.